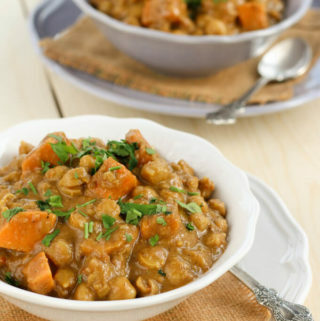 This sweet potato and chickpea curry with coconut milk is delicious, wholesome, and comforting. Just like a curry should be. The flavors have a balance of sweet and spicy notes from the seasoning, sweet potatoes, and the creamy coconut milk. This was the first time I cooked sweet potatoes and chickpeas in a curry. My chickpea curry is a very traditional North Indian curry which usually has no other key ingredient. I was cooking for our weekly meditation gathering where we usually make a vegan dinner and my first instinct was to make the simple chickpea curry with rice but then I remembered coming across a coconut milk based chickpea and sweet potato curry and decided to give it a go. It turned out so delicious that I know I’m going to make it often. This was also after a long time I was cooking with coconut milk. My potato and coconut milk curry was also a hit and I’m thinking I have to try more Indian curries and dals with coconut milk. They add such a beautiful creaminess to the curries and as we turn more towards vegan cooking, coconut milk will be a great alternative to milk and milk cream in recipes like soya-spinach curry or malai paneer. Coconut milk is made by grating and soaking the white coconut flesh in hot water. The liquid, which is coconut milk, is then strained using a cheesecloth. Coconut flesh, when used in moderation, can bring a lot of health benefits to you. It is rich in fiber, vitamins C, E, B1, B3, B5 and B6 and minerals including iron, selenium, sodium, calcium, magnesium and phosphorous. 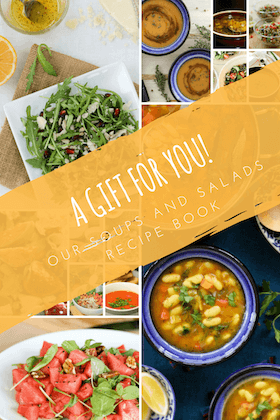 You can use it is as a base for smoothies, breakfast cereals, puddings, and in curries. I loved it how the thick creamy coconut milk curry coated the soft sweet potatoes and chickpeas in this recipe. I hope you will love it too! If you like this recipe, please take a moment to rate it and/or leave your comments at the end of the blog. It will really encourage me to keep exploring, learning and improving. 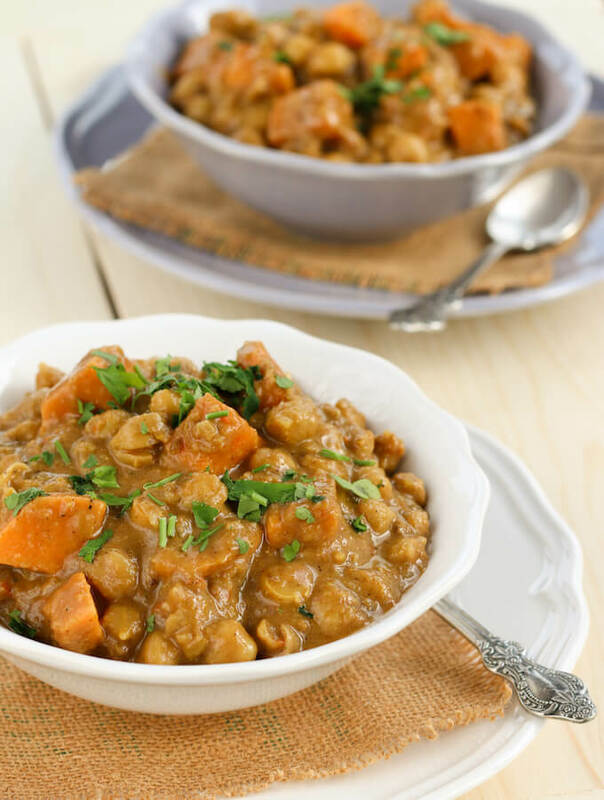 This sweet potato and chickpea curry with coconut milk is creamy, delicious, and comforting. Just like a curry should be! Pair it with brown rice for a nutritious and wholesome meal. Drain the soaked chickpeas and boil in 4 cups water with some salt and turmeric, until they are soft. We use pressure cooker for faster cooking. On the side, steam the chopped sweet potatoes. You can also roast them in an oven or pan fry them with a little oil on stovetop. Heat oil in a deep pot. Once the oil is hot add cumin seeds, ginger, and garlic. Stir and cook for a minute. Add in chopped onions and cook for another 5-7 minutes, with occasional stirring, till the onions start to brown. Now add the tomato purée and all the remaining spices, except garam masala. Mix well. Cook for another 5 minutes. Add a little water if the curry starts to stick. Mix in the coconut milk cream and bring to a boil. Drain the chickpeas but retain the water they were cooked in. Add the steamed sweet potatoes and the chickpeas to the coconut curry. Add around 2 cups of the chickpea stock. Mix well and cook covered on medium-low heat for 10 mins. Sprinkle garam masala and garnish with fresh coriander or parsley leaves. This curry is very mild because I made it for a specific gathering; if you like spicier curry, add a green chili along with the ginger-garlic or use a hot red chili powder instead of paprika.